This article deals with the "Egg Fleet" stage in Sonic Heroes. For more about the armada's role in other games and as a storyline location, see Eggman Fleet. Egg Fleet is the thirteenth stage of Sonic Heroes. 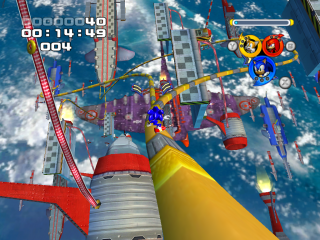 Set amidst Dr. Eggman's armada of heavily-armed aerial battleships, this level sees the heroes fighting their way across the stratosphere, hopping from one steel behemoth to the next as they push towards the massive flying headquarters. The ships are all fish-themed in design, with metal sharks and narwahls being visited (and destroyed) as even larger iron stingrays and whale sharks fly past in the background. Under almost constant bombardment by the ships' cannons, having the characters stand in one place for too long is not recommended. "Eggman" launched the Eggman Fleet back in Bullet Station, and after Mystic Mansion the teams (somehow) find their way several miles up in the air to take on the armada. Even though their three-day deadline has expired, Team Sonic is determined to halt the Doc's plans. Shadow announces that even if he is an android, he's still the Ultimate Lifeform, and is going to make Eggman answer to him. Team Rose are on the lookout for Froggy and Chocola, convinced that they must be held somewhere within the Fleet. And Team Chaotix are directed by their client to infiltrate the fleet undetected; an assignment which, as in Frog Forest, requires liberal use of Chroma Camo. The enemies here are the toughest yet. Falcos strafe through the skies while advanced E-2000 models stand guard over critical shield doors. And, of course, the Egg Pawns are out in force patrolling the decks. At the beginning of the level in Team Dark's story, Rouge will state that they must be close to the edge of space, to which Shadow replies, "Did you say SPACE?". This is an allusion to his fate in Sonic Adventure 2. 20,000 18,000 15,000 10,000 <10,000 Get to Eggman's flagship! 30,000 28,000 23,000 18,000 <18,000 Land on Eggman's flagship! 40,000 35,000 30,000 23,000 <23,000 Find Eggman's fleet! 33,000 30,000 25,000 15,000 <15,000 Infiltrate the flagship without being detected by enemies! 40,000 37,000 27,000 20,000 <20,000 Get to the Goal Ring within 9 minutes! 13:30 14:30 15:30 16:30 >16:30 Defeat 100 enemies! 5:00 5:30 7:00 9:00 >9:00 Collect 200 rings! This page was last edited on 3 March 2018, at 16:57.